At first running for their lives, Molly Templar and Oliver Brooks soon find themselves at the heart of a revolution, and they don’t know which side they’re on. In a world where the monarchy has long been overthrown, where the current regime disfigures the kings and puts them on display, where fey are locked up or forced to wear collars that control their powers, it’s hard to be content with the status quo. Raised in a poorhouse, the only thing certain about Molly’s future is that it’s bleak. Touched by the feymist, Oliver is destined to be an outcast unless he lets the government put a collar around his neck. But when Molly witnesses a murder and Oliver is framed for one, they find themselves on a new–and unwelcome–adventure. 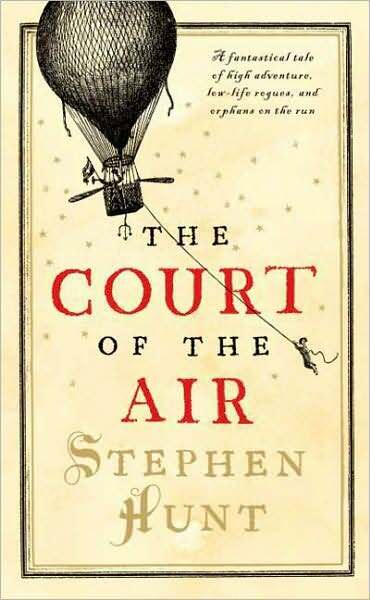 The Court of the Air by Stephen Hunt was my first venture into steampunk, and I feel a bit out of my element writing this review. I read lots of fantasy, historicals, and historical fantasy, but not a lot of sci fi, and I’m not as familiar with sci fi’s traits and tropes. (In written form, at least. I watch lots of sci fi; I just don’t read much of it.) The Court of the Air is a magical tale full of historical inspiration, but I’d definitely call it sci fi. Gritty sci fi, although it does have that fantastical air. It has awe-inspiring aircraft that are essentially hot air balloon warships, and placid steammen who follow the religion of Gear-gi-ju. It also has hideous bio-engineered abominations and dark insect gods. Not to mention lots of bloodshed. Between the subtle plot nuances and intricate worldbuilding, there’s a lot to digest, which makes The Court of the Air a slow read, but in a good way. Flying through it too fast means missing out on a lot of things. The plot unfolds gradually, and with all that it contains, it’s good to pause and mull it over a while before reading on. This is an intelligent read, one that requires you to puzzle things out on your own. The thing that struck me most while reading The Court of the Air was how many other stories it brought to mind. There were times when the communityists’ mantras reminded me of 1984, when the steammen alternately reminded me of the Tinman from The Wizard of Oz and the mechanical world of Disney’s Robots. The subterranean tunnels beneath Middlesteel brought to mind the dark elf city of Menzoberranzan. The fusion of all these things gave the story a touch of the familiar while ultimately creating something completely new. I can safely say I’ve never read or watched anything like it. Between the thick layers of plot and the intense worldbuilding, there wasn’t a lot of room for character development. But that’s not bad in this case. The characters were just sympathetic enough to pull you into the story, and for a plot-driven story like this, I think that worked for the best. The focus was on the story and the unique world it takes place in. Any more would have overwhelmed it. So the sparse characterization works well in The Court of the Air. Now that much of the worldbuilding has been done, however, I’d like to see deeper character development in the rest of the series. Ultimately, I liked The Court of the Air and plan to read the next book. Coming Next Week – The Return of Writer Wednesday! Now Steampunk is something I think I could get into because it blends fantasy, science fiction and historical fiction. It sounds like a cool book. LOL. That’s all right. The back cover copy hooked me in the first line when it said that Molly was apprenticed at a brothel. I love steampunk! It’s so much fun, glad you like it too. This sounds like a fun book – just adding it to the TBR pile. And before I forget, I liked your good review. Dang. My blog stopped sending me emails when people comment. Wonder what’s up? I need to read me some steampunk. This post is from superwench’s account, so maybe the emails have been going to her. I get them when posts from my account go up. Thank you. That clears things up considerably! Oh! Yes, the comments have been coming to my inbox. But my phone/internet service went out on Friday for the third time in four days, and I just got it back an hour ago, which is why it’s taken me so long to respond. Anyway, it’s good to see this review generating so many comments!